At The Trademark Blog, Marty Schwimmer recently noted here the filing of a trademark application to register the alleged mark PODCAST for an "online prerecorded radio program over the internet." (Application Serial No. 78564869, filed February 5, 2005). Other bloggers have expressed various levels of disgust and/or outrage at the attempted "trademarking" of this word. [Editor's note: I am ready to lead a crusade to ban all usage of the word "trademark" as a verb.] Of course, the mere filing of an application does not mean that the word "podcast" is or ever could be a trademark for the identified goods, nor does it mean that the applicant, Shae Spencer Management LLC of Fairport, New York, owns any rights whatsoever in that word as a trademark. Nonetheless, those who believe "podcast" is generic or descriptive and are concerned that the USPTO might actually find this mark registrable, need not sit on their hands. The PTO provides a means for registering one's objection: the letter of protest. Letters of protest are discussed at Section 1715 of the Trademark Manual of Examining Procedure. A letter of protest may be sent to the Commissioner for Trademarks, P.O. Box 1451, Alexandria, Virginia 22313-1451. The letter should not be send directly to the Examining Attorney. "(1) A third party files an objection to the registration of a term because it is allegedly generic or descriptive. The objection must be accompanied by evidence of genericness or descriptiveness. The evidence should be objective, independent, factual evidence that the examining attorney can use to support the suggested refusal. Personal opinions are subjective and may be self-serving, and are not forwarded to the examining attorney. If the protest is granted, the examining attorney is informed that an objection to registration has been filed on the ground that the mark is generic or descriptive, and is given a copy of any factual evidence submitted with the letter of protest." The fee required for filing a letter of protest: nothing. The satisfaction to be gained from voicing your objection: priceless! 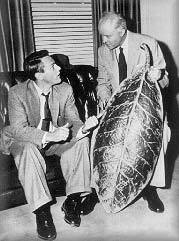 Giant pod, cast of "Invasion of the Body Snatchers"